View from the edge of the American Falls. Love Canal was the scene of an environmental scandal, involving toxic waste leaking into the environment, that brought up issues of liability concerning damage to the environment. It also brings up the notion that we can't assume that our need for progress and its by-products will not cause problems in the future. At the time, toxic waste was buried and was thought to be contained. "Out of site, out of mind." "What we don't know can't be bad." But then it was. Apply that thinking to the modern world (2011). A new oil drilling technique, called "fracking", is promoted as safe. Claims have been made that oil and/or other chemicals will not pollute the ground water supply. At this point, it is still not shown that it can pollute the water but there hasn't been enough time to show it can't either. Do we really need that oil? That's not certain. What is certain is that we, and other organisms, need clean water to survive. Below is a brief video from The New York Times describing the events. Niagara Falls really doesn't have much to do with biology but it sure has a lot to do with experiencing life. 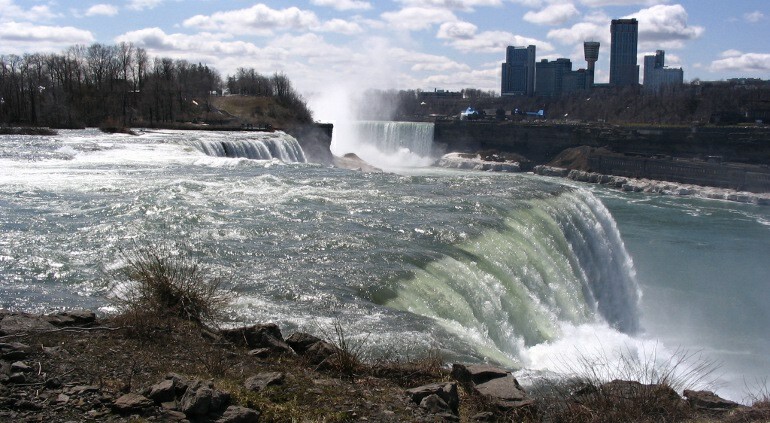 The sheer scale of the falls is something eveyone should experience. They are not the highest falls in the world but they are massive as far as the amount of water flowing over them. The water from four of the Great Lakes (Superior, Michigan, Huron and Erie) flow over them into the fifth, Lake Ontario. Falls.Net - Nice picture tours and a video. Tiplin, A.H. Geology of Our Romantic Niagara. The Niagara Falls Heritage Foundation. 1988.